Now I live at the beach. And not just a sandy beach, but one that has a long stretch of rocky wonderfulness too. I still haul big rocks home almost daily, but my focus now is on small, smooth, flat, wearable rocks. I wander along, hopping across boulders, or shuffling through the slope of smaller stones, looking for the perfect "cookies and marbles." Those are the shapes I most want for jewelry, although other interesting shapes often make the cut. Surrounded by millions of rocks, it's possible to wander for hours, searching for the best of the best. But in all that wandering, I'm sure I often step right over exactly what I'm searching for. Life lesson? Maybe. So sometimes I just sit down for a while and poke around at what's right there at my feet. Back home, I unload my pockets, give everyone a bath, and set them all out on a towel to dry. Then one by one, as each rock speaks to me - over hours or days, it doesn't matter - I choose the "best" one of the moment, and set to work. 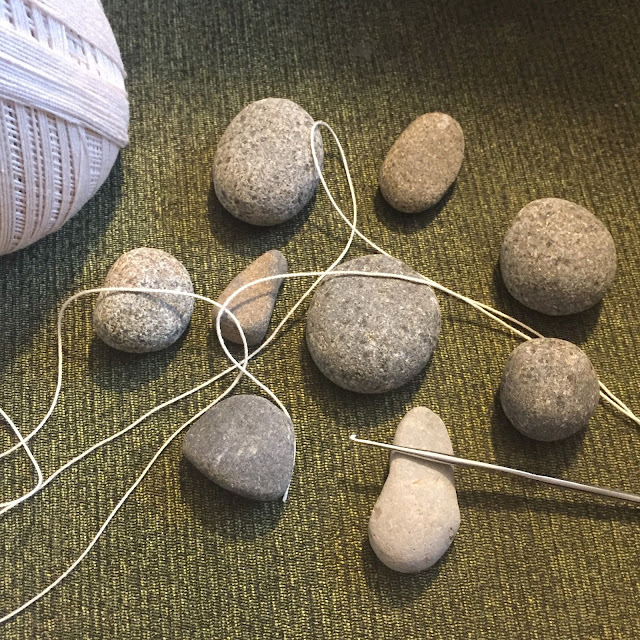 Once finished, there's always a new best rock, next in line, waiting to tell me how to dress it. There's no pattern, no formula. Each one wants to be different. I have my favorites, and I keep them and wear them. I like long necklaces to go with scarves - especially handmade scarves. The rest go home with other people. Some are sold in my Etsy Shop, some are gifted to friends, and some find their way to my tiny gift shop in the Mermaid's Nest, where you can shop in person if you come to stay with us. And sometimes, as a way of thanking the sea for her generosity, I'll take an embellished rock back to the beach, and leave it where I found it.